Sitting down with a basketball legend with a genius-level IQ demands eclectic questions and invites delicious answers. This was a hell of a journey to make for one hour but it was done without a second thought for two reasons. The first is that the 68-year-old Kareem Abdul-Jabbar continues to fascinate. In recent years, he has become a widely read political commentator, writing columns on Black Lives Matter, Bernie Sanders, and Islamaphobia with a unique voice that’s sharply literary, gently radical, and deeply humane. Kareem has adopted this persona after being famously tight-lipped about politics for decades. I wanted to understand why he decided to break his silence. The second reason is that I had questions for Kareem, saved up over decades. I arrived in Los Angeles with my near-30-year-old, fraying, dog-eared copy of Kareem’s now out-of-print memoir Giant Steps. I first read it when I was 11 and still had an 11-year-old’s questions from that initial reading. Following the interview, I am not sure I can truly answer why Kareem has decided to break his long silence. It’s not that I didn’t ask the question or Kareem didn’t answer. It’s more that Kareem’s mind operates in its own unique way. He was curt on the subject, less interested in himself, his own personal motivations, than everything operating in the world around him. 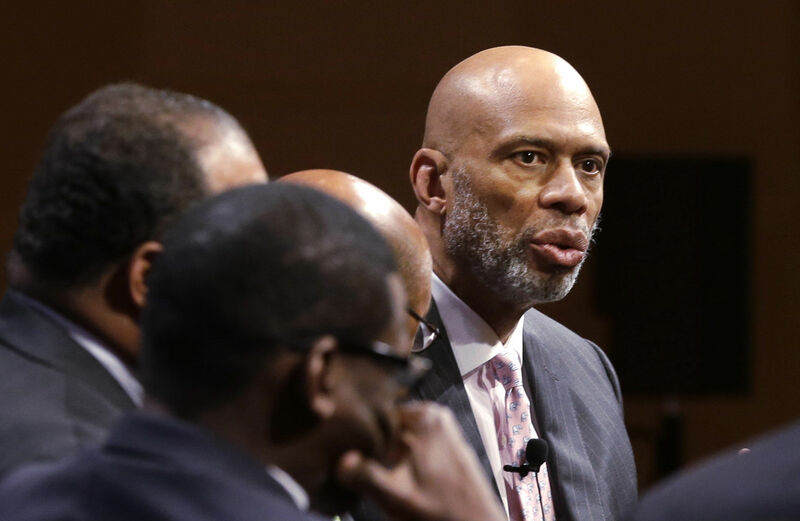 Kareem is certainly, as teammate James Worthy once said, “a different kind of cat.” In today’s sports world, branding and self-promotion have been fetishized, Kareem has no use for that. There is no broadcast deal he is trying to land. There is no job he is angling for. There is just the world, past and present, and his desire to use his utterly eclectic, culture-vulture brain to comment on it. To find out what Kareem had to say as we zig-zagged from subject to subject, please tune in later this week. But notice that out of the above 18 subjects, what’s missing: any conversation about basketball. Make no mistake, I had my questions ready to rumble on the game in which Kareem was almost without peer. (I have Michael Jordan as the only player who breathes Kareem’s air. Six MVPs, six titles, and that skyhook.) I was going to ask Kareem about Kobe Bryant’s last season, players he loves to watch today, and what he thinks of the Golden State Warriors style of ball. But those questions went out the window, because his eyes only lit up when the conversation strayed from sports. By the time we were done with our hour, I felt like I somewhat understood what makes Kareem that “different kind of cat.” As sublimely gifted as Kareem was with a basketball, this is someone who was pretty much drafted to play as a small child because of his startling height as well as the discipline to practice alone in a gym for hours until his gangly adolescence was forged into precocious grace and coordination. If Kareem had been born to be five foot ten, he would have been perhaps a New York City librarian, content amidst the stacks of books and fulfilled by showing that one troubled kid how to find joy in the written word. Librarian Kareem would also have written crime thrillers with a social justice bent after work, just as a hobby. He would have written online editorials about New York’s need to invest in public education and seek racial justice with stinging, literary, and unobvious turns of phrase. In other words, he would have been who he is now at age 68 only he would have started a hell of a lot sooner. By the time the interview ended, it wasn’t as if we had become best buddies but it went well enough that I was able to ask Kareem to sign my moth-eaten copy of Giant Steps. He wrote, “I hope you can continue to enjoy what’s left of this book.” I will and I won’t be alone because the book is still being written.